This suitcase is too cute! The color and flower design are both sure to make it stand out, which will make it easier to find at baggage claim! The rose gold handle is adorable too! Headphones are the perfect gift for anyone who is constantly traveling. Planes can be extremely noisy, so a good pair of noise blocking headphones can really make a flight that much more enjoyable! Some people love using sleep masks, especially on planes. This one is so cute and since it's silk, it won't be irritating to the eyes! We mentioned this watch in our previous gift guide for ladies but we had to mention it again! A watch is a must when traveling because it's important to be on time! After a flight, your skin can feel really icky. That's why a face mask is important! It will rejuvinate the skin in no time! A book is always a must-have when flying. It is so easy to get bored, especially is your phone has to be on airplane mode. When traveling, it is so important to keep track of any cards, ID's, and passports. An organized wallet is the perfect solution for this and will be useful for many occasions, not just traveling! Amazing post, ladies! My travel essential is a good pair of ear plugs! 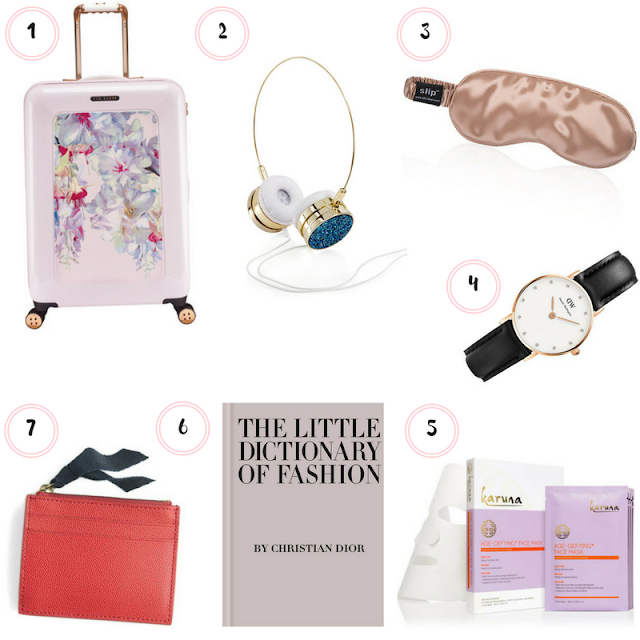 These gift ideas are perfect- I love those bedazzaled headphones! I am definitely going to gift myself with the dictionary of fashion! Wonderful gift guide! Thank you! We love your blog! I'm so in love with that Ted Baker case!